the only way to have both an upper limit of maxvalue and nonetheless apply some add partition logic is to employ the alter table <table> split partition ... statement. some date oriented range partitioning scheme, or better, time windowing technique supposed, the current working partition will be split into the latest archive and the next working partition. see the following figure for illustration. * One of the two resulting partitions must be empty. – If the partition being split is composite, then the storage characteristics of each subpartition in the new non-empty resulting partition must be identical to those of the subpartitions of the partition being split. – If the partition being split contains a LOB column, then the storage characteristics of each LOB (sub)partition in the new non-empty resulting partition must be identical to those of the LOB (sub)partitions of the partition being split. – If a partition of an index-organized table with overflow is being split, then the storage characteristics of each overflow (sub)partition in the new nonempty resulting partition must be identical to those of the overflow (sub)partitions of the partition being split. – If a partition an index-organized table with mapping table is being split, then the storage characteristics of each mapping table (sub)partition in the new nonempty resulting partition must be identical to those of the mapping table (sub)partitions of the partition being split. ok, as far as one can see here, the environment being mentioned with the introduction above does have to regard lob-columns, a text-domain-index and different, evolving storage options as well. bad luck, no automatic optimization possible. the following presents a test case of an approach being employed in practice lately. it contains all this stumbling blocks usually diametrically opposed to an easy going oracle administration and is directly derived from the requirements of a customer site implementation. the basic idea is to have some next working partition already at hand, may it be the next but one month or quarter or year or whatever. that is, one splits an empty and quiet partition to minimize operation resource and time efforts. also, one may benefit from avoiding blocked access to the current working partition along business hours, which last for 24×7 these days. there are some database objects to be set up in advance, specifically a couple of tablespaces and text-domain-index preferences. also, some views have to be defined to easily look up the current operation status. setting up the test table and basic indexes gets the test case scenario going. populate some data and create the ctx-text-index, reminding that the high-end partition of the table shall not contain any data this time. next follows a first review of the operation status using the views being defined above. main attention should be paid to the current storage options of tables and to the indexes at their different index stati. this is were the actual alter table <table> split partition ... statement will be executed. please note the dedicated table and lob storage options given along the statement. after executing the alter table <table> split partition ... statement you will find any affected index status be valid, as desired. however, the storage options of the text-domain-index secondary tables and indexes, that is the DR#-objects, do not meet the demands given in the text-domain-index preferences above. 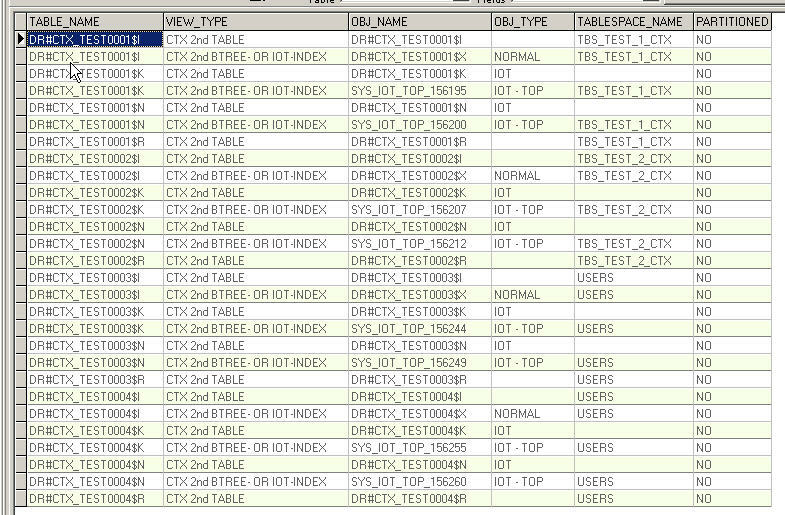 they reside in the users default tablespace (see the tablespace_name column for the DR#CTX_TEST003- and DR#CTX_TEST004-objects in the figure below). the two affected text-domain-index partitions have to be rebuild, which is quite an efficient operation because no base table data has to be processed so far. rebuilding the text-domain-index partitions also finished the test case scenario for an empty next working partition. the split partition approach may work well and without much noise against the high end of an oracle range partitioned table if there still is an empty next working partition available. but even in that case, the resulting text-domain-index partitions have to be rebuild to realize specific storage options for the secondary index tables. the provided views may also be applicable for other investigations outside the presented test case. specifically v_test_ctx_index_status, in its highly compact layout, can be recommended to diagnose all the users text-domain-index statuses at one spot. Very nice example and explanation! Frustrating that even when specifying the SAME tablespace for the TEXT index partition being split (the old MAXVALUE partitions) that the index has to be rebuilt when data resides in the MAXVALUE partition. This doesn’t seem to be the case with non-TEXT index partitions though. Jep, true. When oracle text indexes (aka domain indexes) come into play, yet another sophisticated administration toolsets cease to work. dbms_redefinition is the most depressing example, for it claims that everything is ok for the check step but it eventually fails at the sync step (because they use hot mat-views under the covers that have no idea of domain indexes).